We live in an age of information that is driven by electronics. In fact, electronic devices are growing so pervasive in our culture that we almost forget the many decades of innovation and discovery it took to bring them here. Electromagnetics - the study of the interactions between light, magnetism, and electrical charge - is the foundation upon which the entire information age is built, making it a key field of study for budding young scientists and engineers. Unfortunately, working knowledge of electromagnetics requires a dedicated study of highly technical fields over many years. Much of the physical beauty of the subject is therefore buried under many layers of complex mathematical theories. Visualization allows us to break free from the constraints of abstract mathematics by helping us to "see" the arrangements of electromagnetic fields in space and time. This is a powerful tool for both education and design, as it helps us to build a working intuition about the behavior of electromagnetic systems. While the resulting images possess a remarkable aesthetic beauty in their own right, the real beauty is in their ability to represent real, physical situations with practical application. Cellular communications, medical diagnostics, and home computers are just a few of the technologies that exist thanks to our understanding of this beautiful phenomenon. 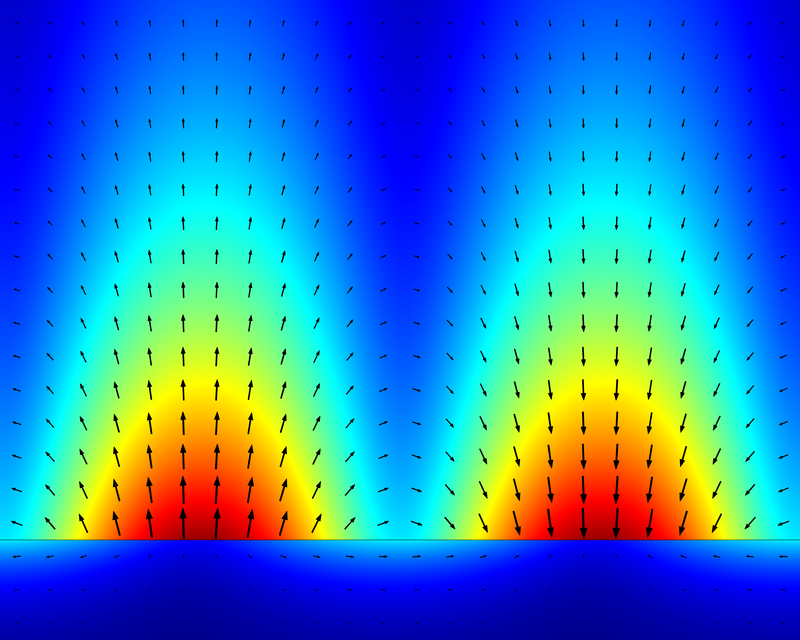 The Parallel Plate Capacitor: The electric field distribution of two oppositely charged metal plates. The colors represent the magnitude of the electric fields, with blue being weakest and red being the strongest. 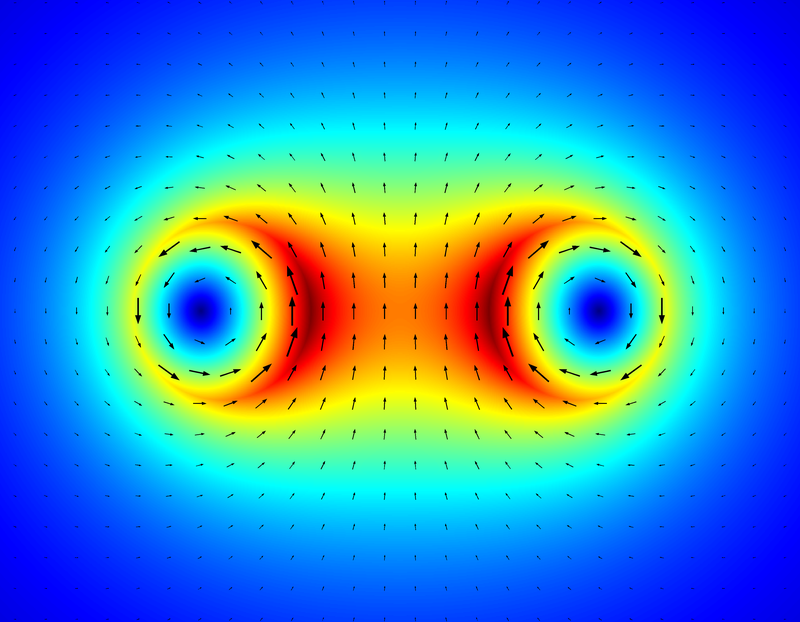 The little arrows represent the electric field vectors, indicating the direction of the fields in space. This arrangement of two metal plates is the simplest form for an electrical device called a capacitor, and is one of the fundamental building blocks of all electrical circuits. 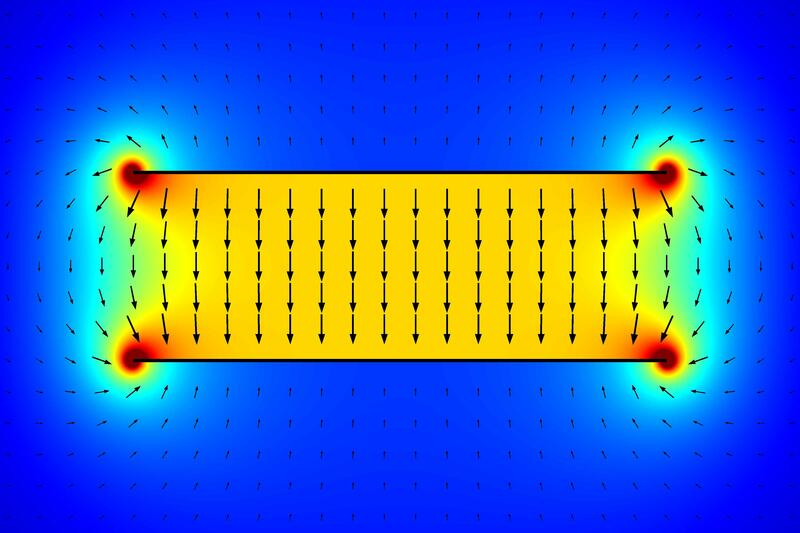 One key feature of the device is that the electric field between the plates is relatively uniform, as seen by the smooth yellow region in the middle. The fields around the edges and corners are called fringe fields. Image generated using FDM. Two Right Circular Rods of Opposite Charge: The electric field distribution of two cylindrical rods of uniform charge density. The left rod is positively charged, and so the electric fields emanate from that end. The right rod is negatively charged, causing the fields to terminate on it. A geometrical arrangement of this form is commonly referred to as a dipole. Image generated using FDM. Two Right Circular Rods of Parallel Current: The magnetic field distribution from two circular rods with parallel electrical currents. The yellow/white regions indicate high field intensity while the red/black regions indicate low field intensity. The electrical current in each rod is flowing out of the image. Any flow of electrical current produces magnetic fields that "curl" around the direction of flow. This phenomenon is the basis for electromagnets. Image generated using FDM. 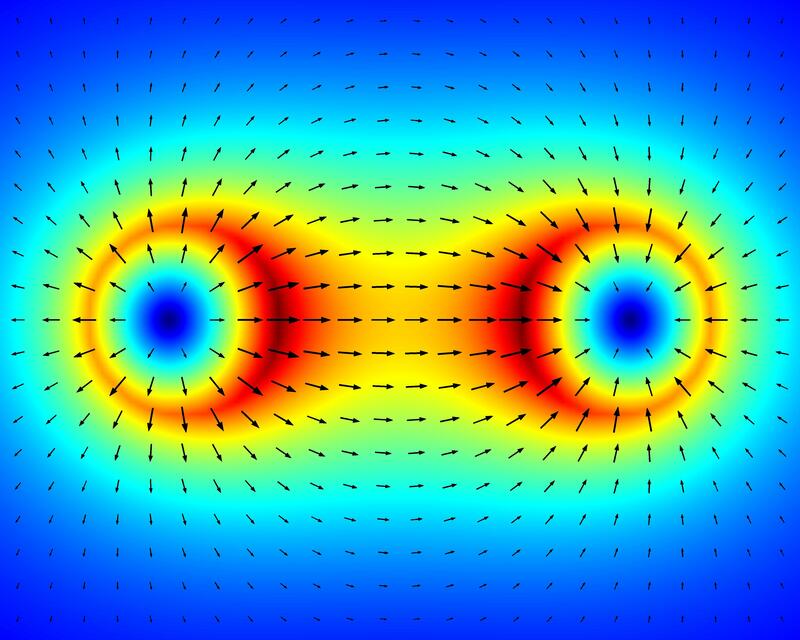 Two Right Circular Rods of Opposite Current: The magnetic field distribution from two circular rods with opposite electrical currents. Image generated using analytical calculation. 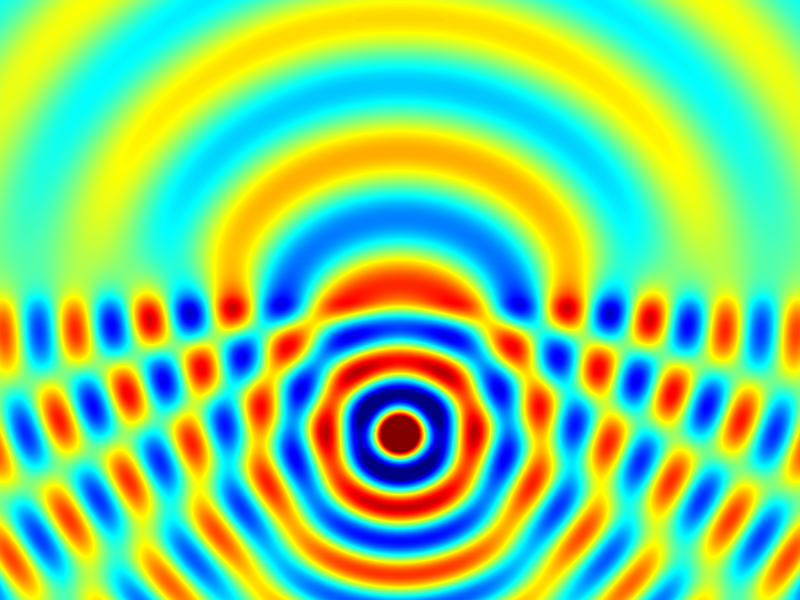 Surface Plasmon Polariton: A peculiar phenomenon occurs at the boundary between a conductive metal (like copper or aluminum) and a dielectric (like air or glass). When excited properly, electrical charges along the surface of the metal can propagate energy in the form of waves bounded to the metal/dielectric interface. This is the basis for a field of study known as plasmonics, and is still leading to new discoveries and new electronic devices to this day. Image generated from analytical expressions. 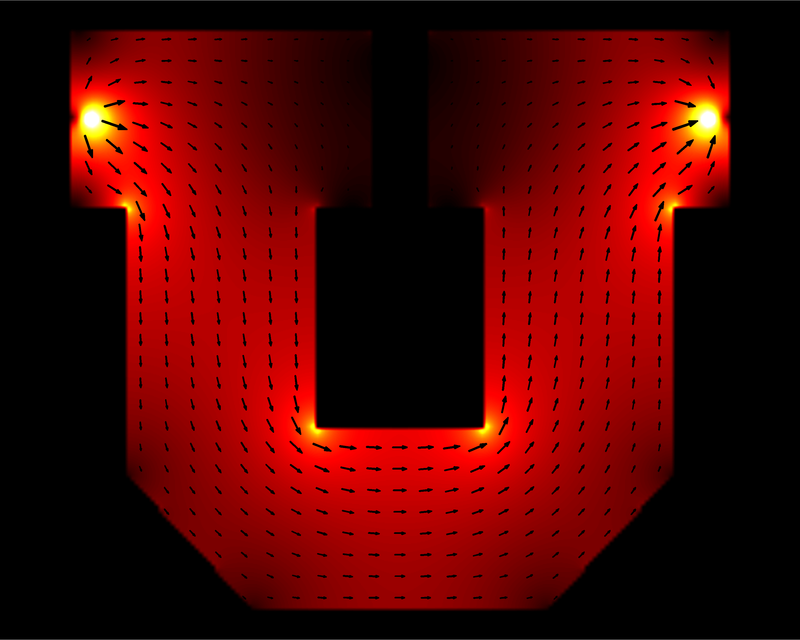 The Current U: Imagine if the U-logo were constructed out of a conductive metal. Now touch the positive and negative terminals of a battery to the tips of the U near the two bright spots. The color map and arrows represent the flow of electrical current between the two tips. Notice how the current tends to pile up in little bright spots around the corners as it tries to take the shortest route between terminals. We can also see the dark regions near the top center where the current has nowhere to go. Image generated using FDM. 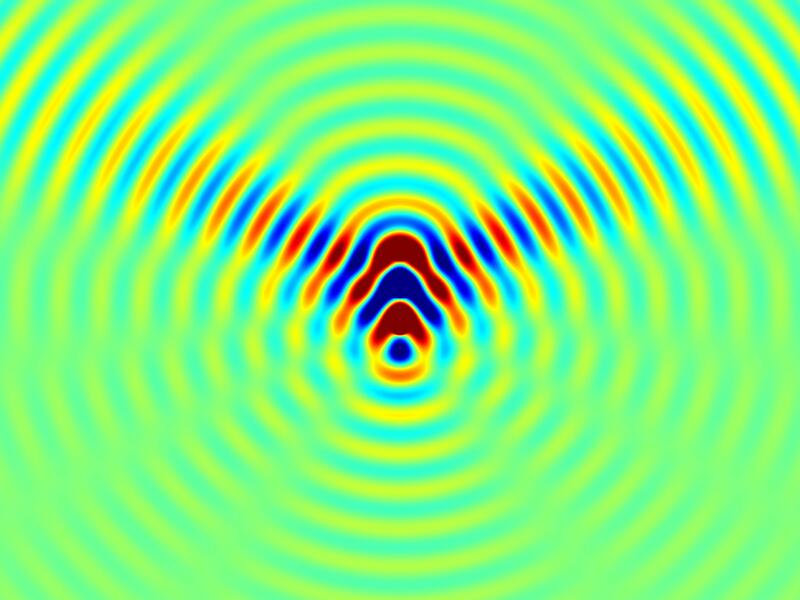 The Hertzian Electric Dipole: One of the most basic antennas is a mathematical concept known as the Hertzian dipole, named after the German physicist and radio pioneer Heinrich Rudolf Hertz. Essentially it behaves as an infinitesimally tiny bit of electrical current that radiates the electric field intensity shown here. This concept is invaluable to antenna engineering because any arbitrary arrangement of electrical currents can be broken down into little contributions from individual Hertzian dipoles. Image rendered from analytical expressions. Beam Forming by a Six-Element Dipole Array: When multiple antennas are placed in proximity to one another, their radiated energy tends to overlap, or interfere. In some directions, this overlap adds to the intensity of the final wave, while in others it can cancel out entirely. When designed properly, the radiation of energy can even be steered into specific directions with very high precision. This is extremely useful for such applications as wireless communication over long distances, aircraft tracking radar, and radio astronomy. 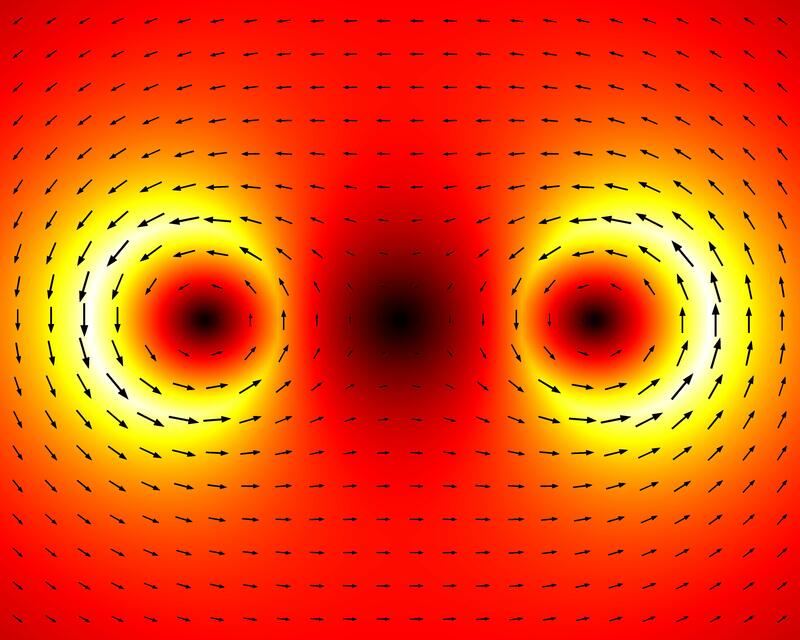 Here, we are looking down onto the electrical field radiated by six Hertzian dipoles. Notice how there appears to be a main beam that is skewed at an angle into space. Light Scattering by a Circular Metal Cylinder: The cross-section of a TE electromagnetic plane wave as it strikes a metal cylinder. Notice how some of the wave energy appears to "bend" around the edges. This phenomenon is known as diffraction, and is a common feature to all waves. Even though there is a distinct shadow region behind the cylinder, it is never quite in perfect darkness. Light Extraction from a Dense Dielectric Medium: A line source radiates from inside a dielectric half-space (n = 2). Light that falls within the escape cone is partially transmitted into the target region while all light beyond the escape cone experiences total internal reflection. 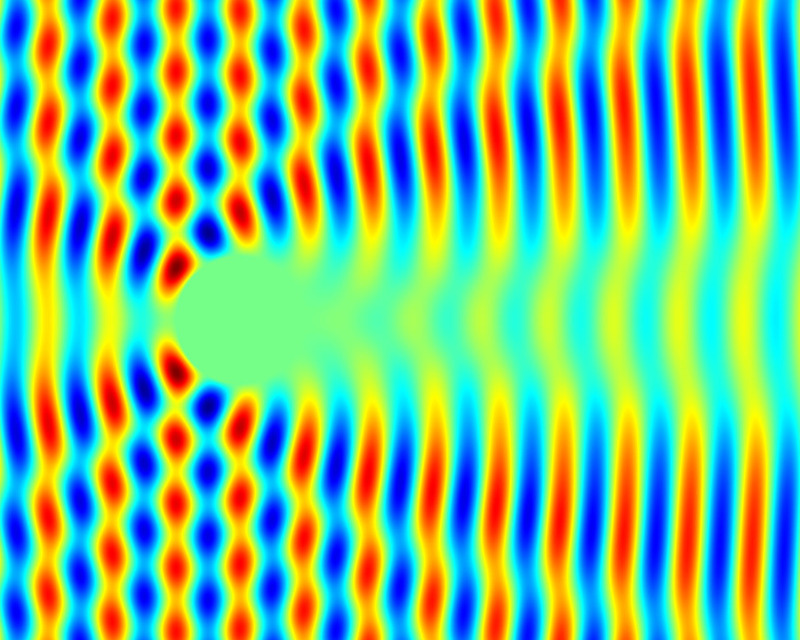 Image calculated using a finite plane-wave expansion of the cylindrical functions.